The Illustrated Atlas of Scheduled Castes of India has depicted a comprehensive picture of the Scheduled Caste Communities, particularly the weaker sections of the people of India, 1991, the Scheduled Castes’ population constitutes about 16 per cent of the total population of India and 478 communities have been notified under the Scheduled Castes of India. The distribution of population of the caste communities is shown rankwise on population strength in each state/union territory up to district level and the data used for showing the distribution pattern of the Scheduled Castes are recorded from the Census, 1991. The atlas has evolved 31 plates which comprise two maps of India, six regional, twenty four state maps and three maps of union territories. Only one state, viz. Nagaland and two union territories, viz. Andaman and Nicobar; and Lakshadweep and Minicoy Islands are excluded, because Scheduled Caste communities are not recorded there. 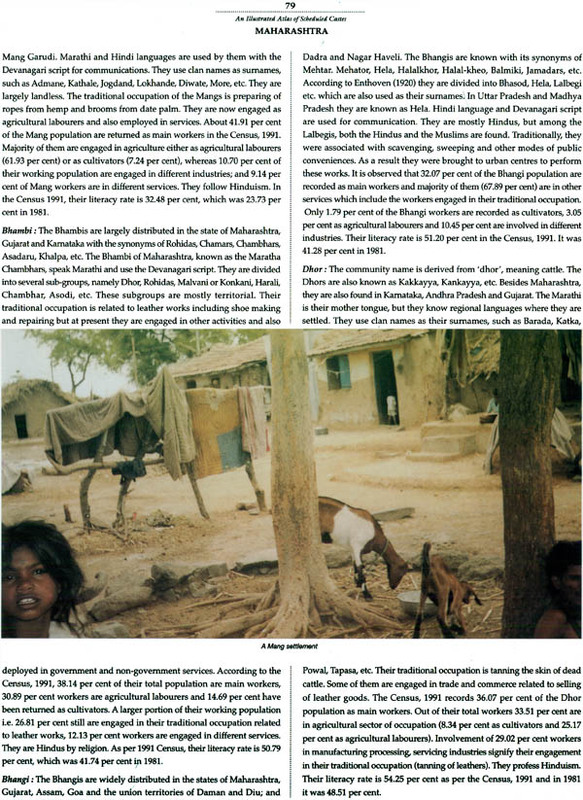 The appendix has included a list of Scheduled Caste communities and their statewise distribution. The atlas has also been enriched by a comprehensive table on distribution and percentage of Scheduled Caste population of each state/union territory, from 1961 to 1991. 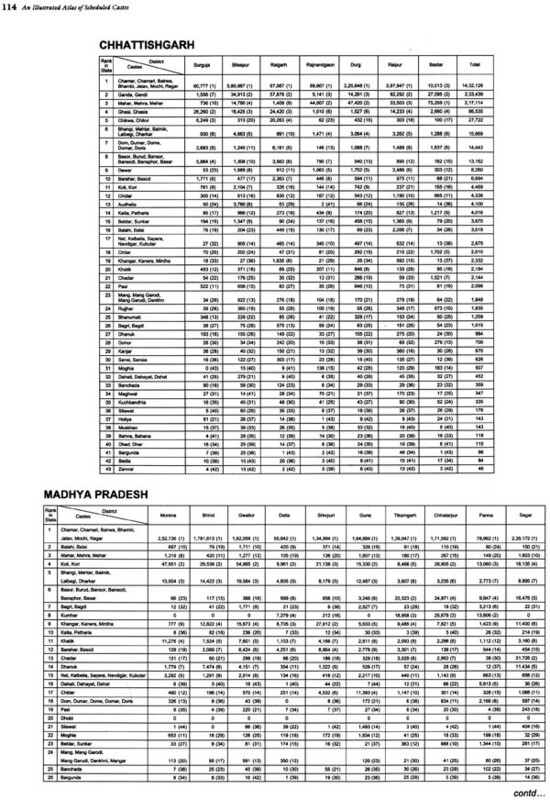 Apart from those there are tables showing state/district level ranking on Scheduled Caste population of India, 1991. Dr. Hrishikesh Mandal(b. 1944) : Professionally as Human Ecologist retired from the Anthropological Survey of India in 2004. He undertook different regional and national projects of the Survey during the last 30 years. His main area of interest in research work is human Adaptation under different ecological conditions. Among his published books and articles, India: An Illustrated Atlas of Tribal World bears a hallmark in the field of Social Science. His writings on environmental issues and its management are noteworthy. Dr. (Mrs.) Archana Datta (b. 1946) : Research Associate of Anthropological Survey of India obtained Ph. D. degree in Geography from the university of Calcutta. She has carried out extensive field work in West Bengal, Bihar and Sikkim under different projects of the Survey and published books and a good number of articles in reputed journals and edited books. Cartographer of Anthropological Survey of India obtained Ph. D. degree from the North Bengal University. He was involved in different regional and national projects and undertook extensive field work in Andaman and Nicobar Island, Assam, Meghalaya, West Bengal, Uttar Pradesh and Madhya Pradesh. A good number of papers are published in his credit. Formerly Cartographer of Anthropological Survey of India. Presently he is in the Census of India and has earned proficiency in mapping technology. He has published a good number of scientific papers and popular writings in reputed books and journals. Cartographer of Anthropological Survey of India. She was involved in different regional and national projects and carried out extensive field works in Sikkim, Assam, West Bengal, Bihar and Orissa, A good number of books and papers are published in her credit. The present book entitled, “India : An Illustrated Atlas of Scheduled Castes” gives a rare distinction to the Anthropological Survey of India, since it is an maiden endeavour to project the weaker sections belonging to Scheduled Castes of India through maps and photographs. The survey as a premier research centre of Social Science has published a number of books and memoirs on human surface in respects of its bio-cultural attributes. But presently the Survey has taken keen interest to prepare some thematic maps and atlas on the Scheduled Tribes and Castes. As a result two maps-i) India : Scheduled Tribes and ii) India : Scheduled Castes showing distribution of Communities upto the district level are the important productions of the survey. The preparation of “India : An Illustrated Atlas of the Tribal World” is also another important production, which has given a new dimension to the projection of tribal cultures in relation to their immediate physical environment. This atlas depicted a comprehensive picture on the distribution of 418 tribal communities in India. The preparation of “India “ An Illustrated Atlas of Scheduled Castes” is the first attempt of the survey in the country that 478 Scheduled Castes Communities are shown distributed upto the district level of each state and union territory as per 1991 Census record. The most interesting feature of the atlas is the arrangement of plates under six regions, such as North-East, Eastern, Northern, Western, Central and Southern regions which have been illustrated nicely in the regional profile of Scheduled Castes illuminating the nature of regional variation in distribution under different ecological zones. Out of two maps of India, one plate has projected five major scheduled castes in each state/union territory as per rank on population size and first ranked castes of each state and union territory are highlighted in different colours so as to make the readers understand and visualize at a glance. The second plate of India has depicted the growth and variation of scheduled caste population since 1961 to 1991. Besides, the atlas will help the reader to know the numerically dominant castes of each state and union territory from the state plates and in each plate the communities are shown rankwise on population size as per the Census record of 1991. However, the atlas has accommodated 31 plates with a huge quantity of data in a systematic way maintaining the cartographic techniques with colourful background and the major castes have been illustrated with a brief ethnographic accounts and colourful portraits. I hope, the atlas, will facilitate a reader, researcher or planner to have a quick estimate of the total population of any Scheduled Caste Community spread over the country. The project proposal for the preparation of the atlas of Scheduled Castes was first accepted by Dr. R.K. Bhattacharya, former Director, Anthropological Survey of India, just after completion of “India : An Illustrated Atlast of Tribal World”. The proposal was approved and executed by Shri Deepak Tyagi and Dr. J.K. Sarkar, former Director-in-Charges of Anthropological Survey of India. I am really grateful to them for their constant encouragement and guidance. It may be mentioned that the data used for showing the distribution pattern of the Scheduled Castes in the states, union territories as well as in the districts are recorded from 1991 Census. The list of communities is prepared according to the Census record of 1991, which shows the list of 499 communities. The twenty one (21) communities are either clubbed or merged with their respective synonyms. As a result a list of 478 communities is given with statewise distribution in the appendix. The appendix has accommodated a huge quantity of data showing distribution pattern of Scheduled Castes population in each state and union territory upto the district level. The Plate No. 1 of the atlas shows the distribution of numerically dominant communities, which hold the first position in their respective states and union territories. As such 16 communities are highlighted in different colours. The Chamar as the highest populous community among the Scheduled Castes are shown in Uttar Pradesh, Uttaranchal, Bihar, Jharkhand, Madhya Pradesh, Chhattisgarh and Rajasthan. The Adi Dravida and the Adi Karnataka are mainly concentrated in Tamil Nadu and Karnataka respectively, the Pulayan are found in Kerala. The Mahar and the Mahiyavanshi are largely settled in Maharashtra and Gujarat respectively. The Balmiki hold the highest concentration in Harayan and Delhi. The Madigas are maximum in Andhra Pradesh. The Namasudra and the Kaibartta are in large number among the Scheduled Caste communities in Assam, Arunachal Pradesh, Manipur, Mizoram and Tripura. The Pans are concentrated in Orissa holding the first position. The major concentration of Rajbanshi is found in West Bengal and the Kamis are settled with maximum population in Sikkim only. The Kolis hold the first rank in Himachal Pradesh and the Mazhabis in Punjab. I on behalf of my co-authors and team members express my heartfelt gratitude to Dr. V.R. 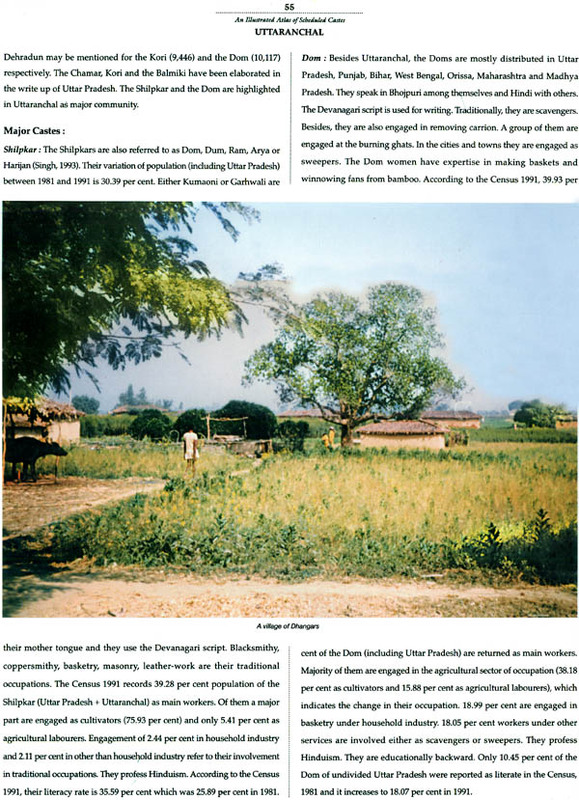 Rao, the present Director-in-Charge of the Anthropological Survey of India for his constant co-operation, support and encouragement, otherwise this publication has not been made possible in stipulated time. We are thankful to the Surveyor General and the Director, Survey of India, Map Publication for certification of maps of this atlas. The members of the Human Ecology Section namely, Dr. Sudhanshu Gangopadhyay, Shri Swapan Saha and Late Swapan Dutta were always besides us in extending all possible help and co-operation as and when required in this regard. We are thankful to the photographers of our regional centres who provided the valuable photographs for this book. We express our gratitude to Shri Pijush Mukherjee, Publication Officer of the Survey who has extended his selfless co-operation and help in the selection of photographs. We are also grateful to all the Heads of Regional Offices of the Survey who extended their co-operation in sending photographs required for illustration of the atlas and also thankful to the photographers of our Regional Centres for the same. We take the opportunity to express our gratitude to M/s Caps Micrographics, specially to Shri Chandan Dasgupta, Director of the organization and Shri Rabin Mukherjee, for their constant co-operation and suggestion in printing this atlas. It is really our maiden attempt in preparing this illustrated atlas in the field of social science specially in order to study one of the weaker sections of the people of India. We as authors shall be grateful to the readers who call our attention to errors or serious omissions. According to the Article 341 Constitution of India empowers the President of India to specify the castes, races and tribes; to be included in the list of Scheduled Castes in relation to a particular state or Union Territory. The first general Census of India was taken in the year, 1881. The second general Census of India was taken in 1891. In 1891 Census an attempt was made by the Census Commissioner to classify the population on the basis of caste, race and grade. The third general Census of India was taken in 1901 and in this Census the concept of touchable and untouchable castes was not clear. In the Census of 1921 the Census Commissioner, J. T. Marton separated a list of the Castes as “depressed classes” from the main stream of the Hindus. In 1931 Census, Hutton, as Commissioner of Census, identified some criteria for classification of depressed classes who had been suffering from serious social and political handicap on account of their degraded position in the Hindu Society. Accordingly the Indian Franchise Committee had passed an order to the Provincial Government of the State to prepare a list of depressed classes under the banner of “Scheduled Castes” and the order in this regard was issued in 1936 (Chatterjee, 1966, Vol. III). According to 1941 Census, the Scheduled Casted population was 13.49 per cent of the total population of India followed by 14.40 per cent in 1951, 14.67 per cent in 1961 with the total Scheduled Caste population of 138,223,227. It has been observed that there was a regular decadal growth in Schduled Caste population since 1941 to 1991. But the distribution of Caste population is not even in all the states and union territories. The data used for showing the distribution pattern of the Scheduled Castes in the state/union territories as well as in the districts are recorded from 1991 Census. The atlas has evolved 31 plates which comprise two maps of India, six regional, twentyfour state maps and three maps of union territories. Only one state viz. Nagaland and two Union Territories, namely, Andaman and Nicobar Islands; and Lakshadweep and Minicoy are excluded because Scheduled Caste communities are not recorded there. Arrangement of the plates have been done on the basis of regional sequence. Thus, India as a part of Sub-continent has been classified under the following regions, such as (1) North-East region, (2) Eastern Region, (3) Northern Region, (4) Central Region, (5) Western Region and (6) Southern Region. These regions are categorized on the basis of some common cultural traits which would identify them as the inhabitant of the particular region. Every region has been depicted through a regional map along with the respective state/union territory maps. Each plate of state/union territory maps projects the districtwise distribution pattern of the Scheduled Caste communities and also shows the numerically dominant castes in the respective states or union territories. These dominant castes are arranged rankwise on their population size. According to 1991 Census the largest concentration of the Scheduled Castes is found in Northern Region (21.71 per cent), followed by Eastern (20.57 per cent), Southern (16.07 per cent), Central (14.42 per cent), Western (12.34 per cent) and North-East Region (6.84 per cent) respectively. As per 1991 Census record the Scheduled Castes population of the states as compared to the percentage of the total Scheduled Castes population in India (138, 223,277), it is found that Uttar Pradesh possesses the highest rank (21.18 per cent) followed by West Bengal (11.63 per cent), Bihar (9.10 per cent), Tamil Nadu (7.75 per cent), Andhra Pradesh (7.66 per cent), Madhya Pradesh (6.96 per cent), Maharashtra (6.34 per cent), Rajasthan (5.50 per cent), Karnataka (5.33 per cent), Punjab (4.15 per cent), Orissa (3.71 per cent), etc. the concentration of Scheduled Caste population is found negligible in Arunachal Pradesh, Mizoram, Daman and Diu and Dadra Nagar Haveli. Whereas the state level picture of the Scheduled Caste population in relation to the total population of the respective states shows that Punjab holds the highest position (28.31 per cent) in the northern region followed by West Bengal (23.62 per cent) in the Eastern Region; Tamil Nadu (19.18 per cent) in the Southern Region, Tripura (16.36 per cent) in the North-East Region, Madhya Pradesh (14.55 per cent) in the Central Region and Gujarat (7.41 per cent) in the Western Region. 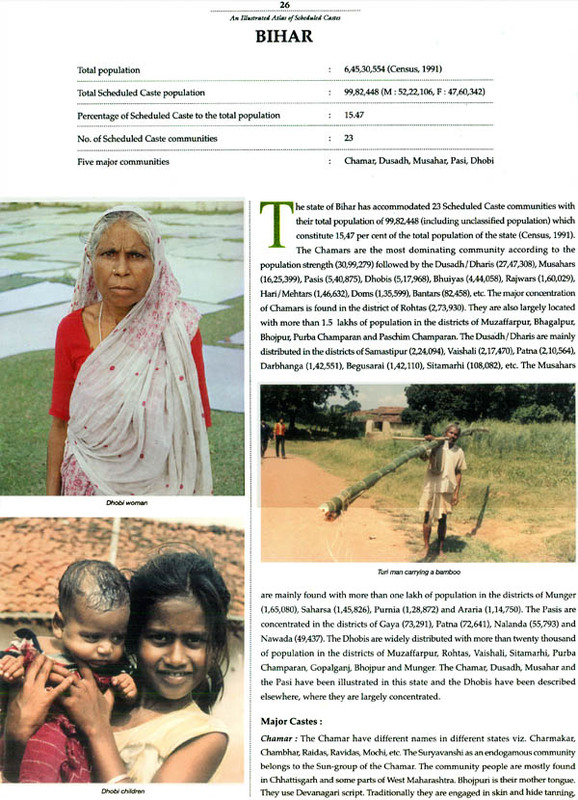 Among the Scheduled Castes communities, the Chamars possess the highest position in the Northern (2,06,91,662), Central (60,99,383), Eastern (48,19,897) and also in the Western Region (30,21,273). In Southern Region the Adi Dravidas hold the first rank with the total population of 61,68,627 and in the North-East Region Namasudras rank first with the total population of 6,76,509. But the highest concentration of the Namasudras is found in West Bengal (25,81,549). According to 1991 Census record, the Chamars hold the first position at national level with the total population of 3,47,29,255 followed by the Adi Dravidas (61,68,627), Madigas (52,15,277), Pasi (50,22,033), Mala (40,02,300), Dhobi (36,35,924), Dusad/Dosadh/Dhari (32,41,371), Rajbanshi (28,39,481), Adi Karnataka (25,46,863), etc. It is observed that the Adi Karnatakas and Adi Dravidas are mainly concentrated in Karnataka (25,13,790) and Tamil Nadu (52,39,405) respectively. The Mala and the Madigas are mostly found in Andhra Pradesh (39,62,941 and 48,39,315 respectively), Rajbanshi and Namasudra are largely settled in West Bengal with the total population of 28, 39, 481 and 25,81,549 respectively. The total literate Scheduled Castes in India was 4,15,62,427 persons which constitute 30.07 per cent of the total Scheduled Caste population in India according to 1991 Census and 36.08 per cent of the Scheduled Caste population are returned as main workers. According to the regional variation in respect of literacy North-East Region ranks first (43.80 per cent) followed by the Central Region (36.40 per cent), Southern Region (35.65 per cent), Western Region (29.23 per cent), Eastern Region (26.52 per cent) and the Northern Region (25.38 per cent) respectively.